Not only do we have the much anticipated ‘Lords of Salem’ hitting cinema screens on April 26th. The man who has more fingers in pies than Sweeney Todd, is also releasing his next full length original album since ‘Hellbilly Deluxe 2’ on April 23rd. The album has been titled “Venomous Rat Regeneration Vendor” and promises to be just as brilliant as any of his back catalogue. Featuring the band he has now been with for quite some time. Piggy D, John 5 and Ginger Fish all together in the studio once again. To mention, John 5 also helped Zombie score the film. And if that wasn’t enough, along with all these goodies comes the ‘Lords of Salem’ companion book which is to feature alternate scenes and an envision the Zombie wanted for the film that didn’t quite cut the finished edit. 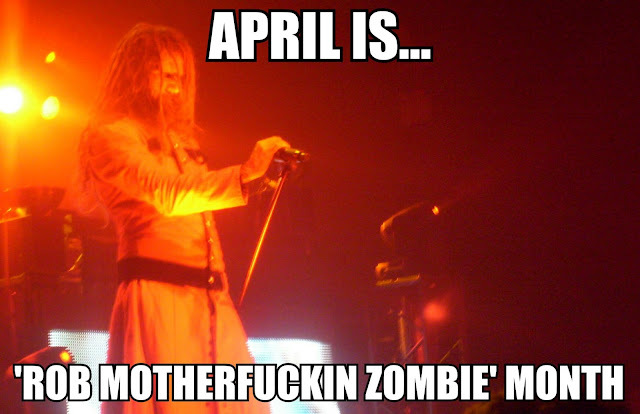 So we at BloodGuts officially announce April as official ‘Rob Motherfuckin Zombie’ Month and will host a whole bunch of events leading to the release of the film/album/book.